Cycling has never lost its appeal. Alongside mass-produced models, the craftsmanship of bespoke bicycle makers has emerged to satisfy the passion of people who ride bikes as a means of daily transport, as a sport and for recreation. 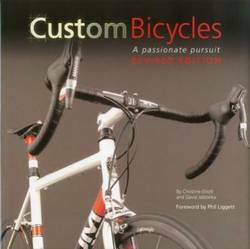 This book by passionate cyclists Christine Elliott and David Jablonka is the product of a worldwide search for the most influential custom bicycle makers on the planet. The result is a presentation of a wonderful collection of expertly honed, human-powered machines, built by some of the most creative bicycle makers in the world. It highlights the range of techniques, materials, design elements, and dedication that go into producing a custom handmade bicycle. It is guaranteed to take you on the ride of your life. With all new text and the addition of the latest in custom bicycles this is the ultimate gift for any cycling enthusiast.